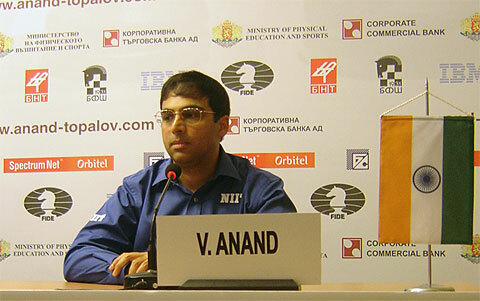 05.14.10 Viswanathan Anand outscored Veselin Topalov 6.5 to 5.5 in the twelve-round FIDE World Chess Championship tournament played in Sofia, Bulgaria from April 23 - May 10, 2010. Tied after eleven games, Anand playing the black pieces, employed Lasker's Defense to the Queen's Gambit Declined and pulled off a pretty victory. 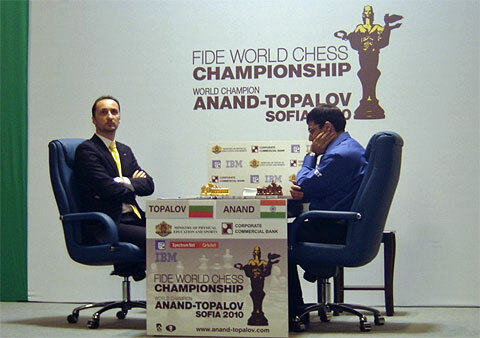 The final game of the FIDE World Chess Championship between Veselin Topalov (left) and Viswanathan Anand. Anand won this game to keep the title of World Champion. You could not have asked for a more dramatic finish to a well-played match. After racing out of the gate winning his first game with white and tying the match in Game 8, Veselin Topalov could not shut the door on the relentless Anand. Outplayed in Game 1, Anand was quickly on the ropes but like a true champion he came back to tie the match in the very next game and take a 2.5-1.5 lead in Game 4. Topalov battled back winning Game 8. The duo traded draws until the final game of the match: Game 12. Anand had black and opted for a classical variation played in many previous World Championship matches--Lasker's Defense! His choice of defence paid dividends as Topalov blundered at a critical juncture allowing Anand to win the game and the match. All ChessBase reports of the 2010 FIDE World Chess Championship including games can be found here. Relieved? Elated? It's hard to tell. Congratulations Vishy!